Braveis Pixar’s first movie to feature a female heroine, and she’s not the traditional “princess” of Disney lore. Merida is many things, the least interesting of which is a princess. Merida is a Scottish lass who is all tumbled red hair and awkward limbs. She says everything with a sense of purpose and her defenses are always up. It’s necessary in her world to be always on your guard. Everyone struggles in their youth at some point against expectations and parents’ goals for the future, even in medieval Scotland and even when you have the world’s most gorgeously animated red hair (seriously, it is mesmerizing and every tendril seems to have a life of its own). Merida’s greatest challenge lies not in the traditional hero’s epic journey (although there are elements of that in the film), but in coming to realize that her own self-worth isn’t incompatible with the importance of family. All this is set in the wonderful CGI’d Scotland that Pixar’s animators have brought to life with loving care and charm. Brave is the first Pixar film directed (well, co-directed) by a woman, but that’s really just trivia when it comes to the results on-screen. Brave is very much a Pixar film in terms of character, story and heart. 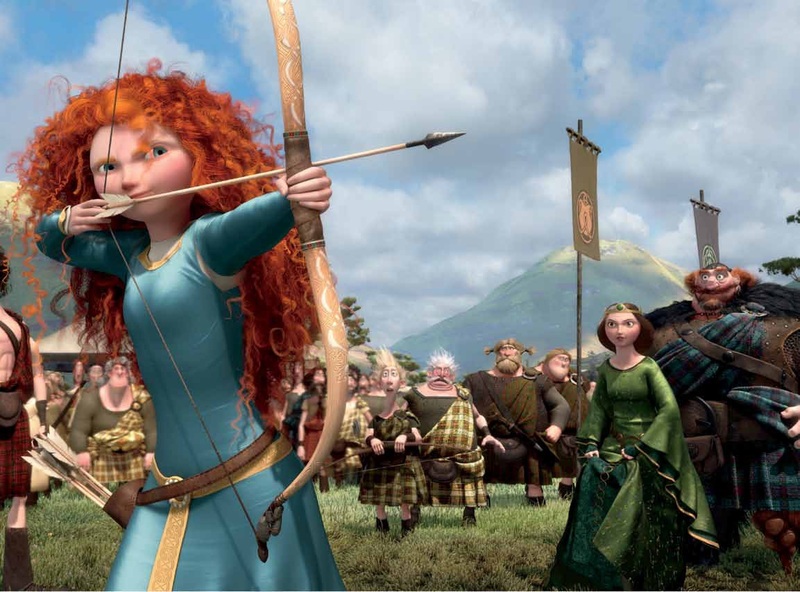 What we’ve come to love about Pixar characters is present in Merida and her clan. Their adventures are fun and interesting. They are humorous without being trite, loving without being corny, and touching without being sappy. Merida (well-voiced with vigor by Boardwalk Empire’s Kelly Macdonald) is the daughter of burly and loud King Fergus (Billy Connolly) and demure and ladylike Queen Elinor (Emma Thompson). She also has a trio of devilish little brothers who provide much of the early sequences’ comic relief. In a Disney/Pixar film, it is nice to see this family dynamic intact. Normally a Disney princess would have a missing parent or an evil stepmother, but Merida has a fully functioning group of folks in her world who genuinely care for her and her well-being. To a teenager, however, all this emphasis on family love and honor can be embarrassing. Merida believes in free will and destiny, in stark contrast to her mother Elinor’s wishes and dreams for her daughter, which involve much the same path she chose for herself: duty, honor and family. This leads to the amusing sequence shown in the previews where Merida upstages her potential suitors for her hand in marriage, and sets off to find her own way in the rough Highlands. 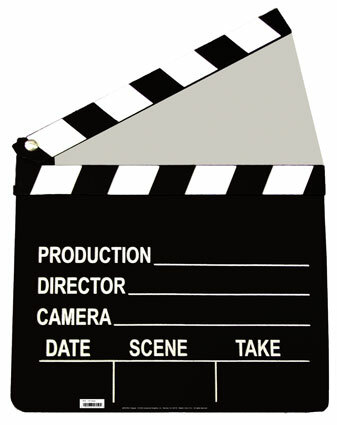 It’s a classic set up for a coming-of-age story. To find a purpose in life, we very often look in all the wrong places first. Unfortunately, Merida didn’t see The Little Mermaid, and perhaps should have been warned about strange old ladies in deep, dark woods and their intentions. The witch of the forest offers Merida a chance to change her destiny, but as with most grand gifts, there is an ironic price. Merida’s desire for freedom impacts her mother, leading to the heart of the story, where Merida must triumph over not just evil forces, but her own flaws, all to find the happiness and freedom that she perhaps had all along. Although the story’s final half hour is a bit rushed, what I loved the most about Brave (other than the joyously lush animation) was the fact that Merida’s tale has nothing to do with needing a Prince Charming to make her life complete. 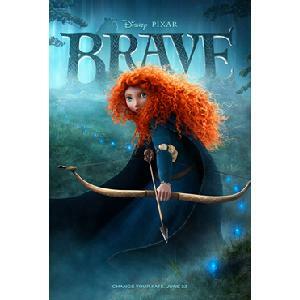 Brave is a tale of self-discovery that has a family’s love for each other at its heart, and that in itself is “brave” route for a Disney movie about a princess to take. Here’s hoping that more heroines like Merida are in Disney’s future.